After serving time with the Royal Navy, Paul started his recruitment career in 1995 with Ruillion where he worked as a consultant. He later moved to a local Yorkshire construction recruiter called Team-Up which, in 1998, was acquired by Hill McGlynn, which later became part of the Randstad Group. Over the ensuing 10 years with Hill McGlynn, Paul progressed from branch manager in Leeds to ultimately become the company’s UK Operations Director with responsibility for 12 blue collar teams across the UK. 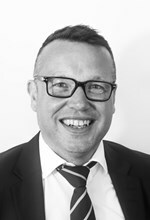 Paul joined Search in August 2009 and assumed responsibility for Search’s three site construction business in the North of England. In the ensuing 8 years, Paul has been instrumental in significantly growing Search’s Construction business across the UK. Paul is a passionate, active and visible director, directly account managing some of Search’s largest construction customers. He is out visiting customer sites every week and manages a very tight business.